All-you-can-eat buffets have become synonymous with cruising, but Virgin Voyages is bucking the trend by offering over 20 different eateries on its Scarlet Lady ship. When the Scarlet Lady sets sail in 2020 from Miami to the Caribbean, the 2,770-passenger ship will change the game by offering more than 20 food choices that are included in the voyage price. While the ship will offer ample eating options, officials revealed there will be no buffet, main dining room, formal wear, assigned seating or assigned dining times. All of the food available will be made to order, which will cut down on waste, energy usage and emissions. In addition, many of the eating establishments will offer extended hours, including a 24-hour diner. 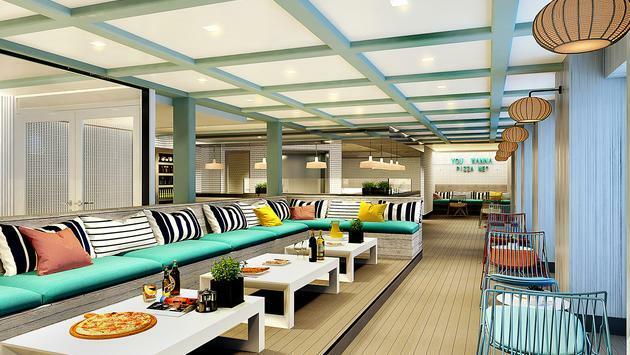 The adults-only cruise line will boast the glamorous Wake restaurant, the innovative Test Kitchen, the casual Pizza Place and more. The Virgin Voyages ship will also feature a Korean BBQ restaurant, a Mexican restaurant, an Italian trattoria, a beach-club-inspired restaurant and a food hall with eight shops. For the travelers who love a cocktail with their food, the Scarlet Lady added a bar in every restaurant.